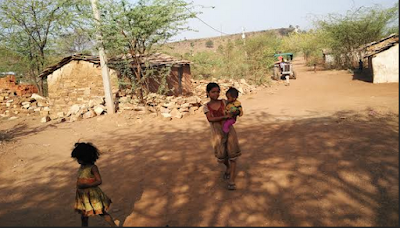 People of the area, close to the spot where the Madhya Pradesh government is seeking to implement a high-profile Rs 20,520 crore diamond mining project, are in distress. Facing eviction under the pretext of "saving" the world’s most beautiful wild beasts and nearly 1,000 hectares of pristine forest, people of dozen-odd villagers have complained that, despite drought conditions, they are not being provided any relief. In a written complaint to the district collector, the villagers have said, despite unprecedented famine conditions, the state government has refused to begin any drought-relief work for the people. “No work is being offered under the National Rural Employment Guarantee Scheme (NREGS)”, the written complaint, dated May 20, says. Pointing out that the decision of representing to the district collector was taken at a meeting of village representatives of drought-affected areas, held at Dhatri Resource Centre, Andhra Pradesh, under the auspices of the civil rights network Mines, Minerals and People (MM&P) and the Prithvi Trust, the letter says, about 50 per cent of the people from many of the villages have migrated out in distress. Demanding that relief work under NREGS should begin immediately, the letter says, there should be “immediate arrangement” for providing water to those people who have stayed back. “There is also an urgent need to provide primary health facilities in the region”, the letter – signed by people from Madaidyyan, Manaki, Manjha, Manavnagar, Kudar, Khajri, Darenra, Purana Panna, Pati, and Sunahra villages – says. Meanwhile, top decision-makers in the country are reportedly weighing the pros and cons of letting Rio Tinto, one of the world’s largest mining companies, look for diamonds under the forests, situated in the vicinity. Already, India’s forest advisory committee – a statutory body in charge of environmental clearance – has looked into the proposal to award the final clearance, and is about to give its final decision in the matter. Apart from displacing tribals, activists assert, the project would destroy the tiger corridor, lead to the destruction of the 492,000 trees, and displace tribals. The project, say official sources, could yield over 34.2 million carats of diamond. Meanwhile, Rio Tinto has said, if implemented, the project would place India among the top 10 diamond producers in the world. It all began in 2004, when the company is said to have discovered a huge reserve. “In September 2006, it secured a prospecting licence, allowing it to continue exploration in the area. In July 2013, the Indian Bureau of Mines approved its mining plan”, a recent report said. Located very close to the Panna Tiger Reserve and the Navardehi Wildlife Sanctuary, this area is home to species such as the monitor lizard, Indian pumped vulture, sloth bear, leopards and the Indian gazelle. Even the government of Madhya Pradesh, in its report to the central government, has confirmed this. “Some rare and endangered species of wild animals (chausinga, leopard, cheetal, chinkara, peacock, etc.) are found in the area. The area is used by tigers as their migratory corridor,” the government said in the report.